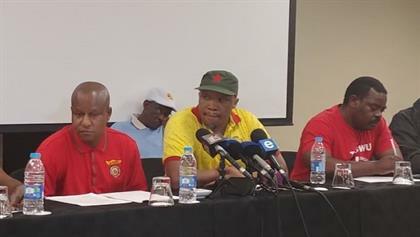 Johannesburg – The bus strike is not over yet, National Union of Metalworkers of South Africa general secretary Irvin Jim said late on Friday afternoon. Employers tabled an offer on Thursday of a 9% wage hike for the first year and 8% for the second. The sticking point right now, Jim explained, is the issue of backdated pay to April 1. "We are now confronted with a difficult position of not calling off the strike," he said, and added that the majority of workers want the backdated pay. Jim said the unions are standing together with their workers. "We will not be blackmailed by the employers. We are not here for the continuation of the strike. We want to say to the employers: pay the workers," he said. "We are going to persuade the employers to come to the party. In fact, this is selfish on the part of the employers. We are saying the strike must come to an end this weekend." He said government needs to come to the party about incentives and subsidies. "We will engage the employers over the weekend in an effort to end the strike which has already been dragging on for 17 days," said Jim. The strike, by more than 17 000 drivers, has ground transport services to a halt in many cities across the country, leaving commuters stranded. Last Sunday the Bargaining Council and the Commission for Conciliation, Mediation and Arbitration (CCMA) proposed an offer of 8.75% pay increases for the first year and 8.25% for the second. The workers had initially demanded 12% across the board, but employers offered 7% for the first year, 7.25% for the second year and 7.5% for the final year. The figure was later reduced to 9.5%, after the CCMA intervened. Jim said he did not believe bosses were speaking with one voice on the issue of pay. "I don't think the employers are united on the issue, therefore it is important that we continue our engagements." The drivers are also demanding better working conditions, including dual drivers on long-distance buses and the insourcing of technical jobs and other labour. "The workers have so far been peaceful, and there is no need to provoke them by taking a hardline stand on the issue of back pay," said Jim. Besides Numsa, the strike is supported by the South African Transport and Allied Workers Union, the Transport and Allied Workers Union of South Africa, the Transport and Omnibus Workers Union and the Tirisano Transport and Services Workers Union. Efforts to end the strike, which is the longest so far this year, included intervention by Minister of Labour Mildred Oliphant, who convened a meeting between unions and employers. Bus services which have been affected by the strike include Rea Vaya, the Gautrain, Putco and Megabus in Gauteng. In Cape Town, the MyCiti and Golden Arrow bus services are affected.